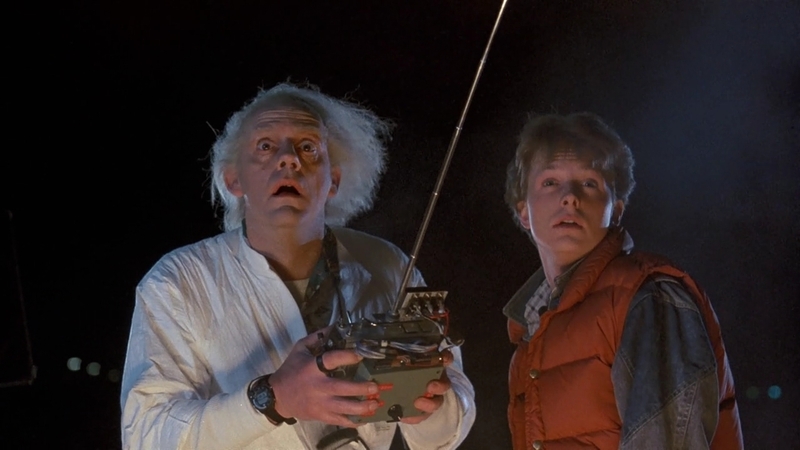 Back to the Future turns thirty today. This is my story. I went with my older sister and her friends. The theater was sold out, and there weren’t enough seats together for us all. Being the fifth wheel, I volunteered to sit apart, which wound up being in the second row, all the way against the left wall. I expected a sore neck. But then the movie started, and I forgot all about the cramped seats and the terrible angle. I was sucked in. Two hours of cinematic bliss. I dug the experience so much, I made habit of sitting as close to the front as possible for the next decade or so, when being overwhelmed by the screen enhanced my viewing experience. I eventually gave that up (getting old has its drawbacks), but I still get lost in those other worlds poking through that giant rectangle. I vaguely remember attempting to tell the movie’s story in scene-by-scene detail to a friend the next day, so excited was I by what I witnessed. I made a point to see it again when it began its official theatrical run. I collected magazine stories about it (most notably a Starlog feature hypothesizing a second Marty from an alternate universe). I ran the cassette soundtrack ragged, as I did the eventual VHS copy, dubbed from a cable broadcast. I studied that film like the Torah. I’ll always regard it with a bit of reverence, a bubblegum masterpiece that helped shape my tastes, my style, my self. That first screening remains one of the best and most influential nights of my cinematic life.